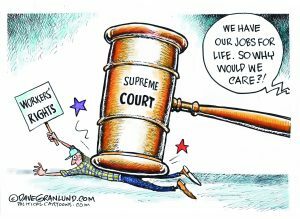 On May 21, in Epic Systems v. Lewis, the Supreme Court ruled that an employer may lawfully require its employees to agree, as a condition of employment, to take all employment-related disputes to arbitration on an individual basis, and to waive their right to participate in a class action or class arbitration. Employees of the Wisconsin-based tech firm Epic Systems sued their firm to recover overtime pay. 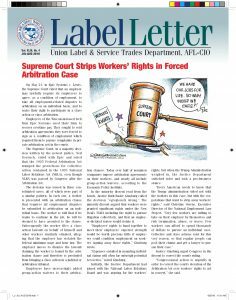 They sought to void arbitration agreements they were forced to sign as a condition of employment which required them to pursue complaints in private arbitration, not in the courts. The Supreme Court, in a majority decision written by the newest justice, Neil Gorsuch, sided with Epic and ruled that the 1925 Federal Arbitration Act trumped the protections for collective action contained in the 1935 National Labor Relations Act (NRLA), even though NLRA was passed by Congress after the Arbitration Act. The decision was issued in three consolidated cases, all of which were part of a similar pattern. In each one, a worker is presented with an arbitration clause that requires all employment disputes be submitted to arbitration on an individual basis. The worker is told that if he wants to continue in the job, he will be deemed to have assented to the clause. Subsequently the worker files a class action lawsuit on behalf of himself and other workers similarly situated, alleging that the employer has violated the federal minimum wage and hour law. The employer moves to dismiss the lawsuit claiming the worker is bound by the arbitration clause and therefore is precluded from bringing a class action in a judicial or arbitration tribunal. Employers have increasingly added group-action waivers to their arbitration clauses. 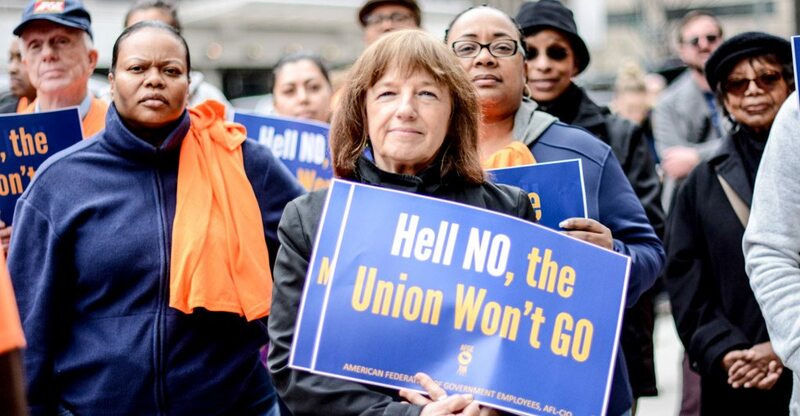 Today over half of nonunion companies impose arbitration agreements on their workers, and nearly all include group-action waivers, according to the Economic Policy Institute. In the minority dissent read from the bench, Justice Ruth Bader Ginsburg called the decision “egregiously wrong.” The minority dissent argued that workers were granted significant rights under the New Deal’s NLRA including the right to pursue litigation collectively, and that an employer-dictated waiver would violate it. “Expenses entailed in mounting individual claims will often far outweigh potential recoveries,” noted Ginsburg. Initially, the Justice Department had joined with the National Labor Relations Board and was arguing for the workers’ rights, but when the Trump Administration weighed in, the Justice Department switched sides and took a pro-business stance. Justice Ginsburg urged Congress in the dissent to correct the court’s ruling.